Can you hear the chimes of the Swiss cow bells? They really do wear cowbells and you can hear them as they move around the fields. This pair were actually way up the mountain where we caught 2 cable cars to reach! They looked very happy lazing in a small patch of sunshine near the Autumn leaves. A fabulous shot and scene. Lovely rural shot. The cow-bells set the scene !! Beautiful scene. 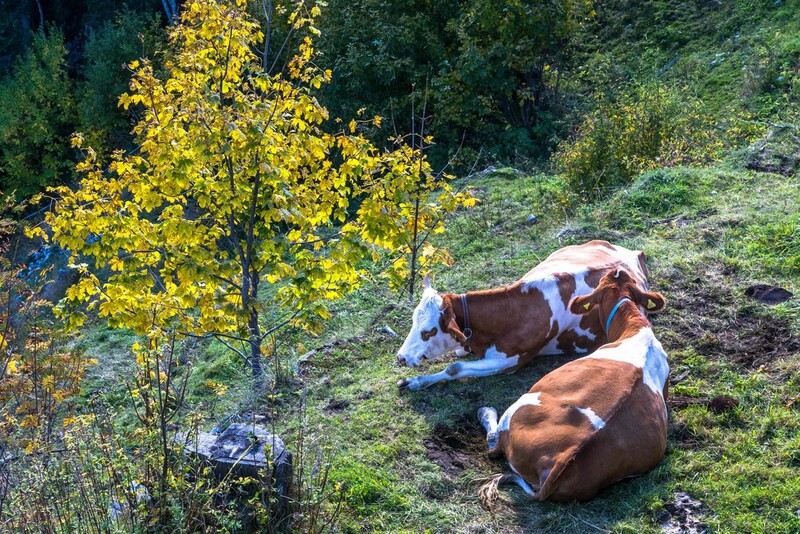 Once in the Swiss mountains we met a few of them being herded down a path with big bells dangling from their necks. i can feel the swiss landscape ! I wish there is no bear around. Nice shot. Cows have to wear bells because their horns don't work, ha ha. Wonderful shot! @onewing - Ha, Ha you're so funny! A POV not usually seen. @onewing ha ha never heard that one!! Super capture! I like your POV! My goodness,they look replete, the pasture must be good up there!